Posted 1:37 pm by Shaun Reitan & filed under cPanel, Security. Posted 5:13 pm by Shaun Reitan & filed under cPanel, Security. Ubuntu 16.04.1 LTS Now Available! Posted 5:18 pm by Shaun Reitan & filed under Announcements, Cloud Servers, Dedicated Servers. We’ve pleased to announce that Ubuntu 16.04.1 LTS is now available in our Cloud Server Manager. Posted 12:43 pm by Shaun Reitan & filed under cPanel, Security. cPanel, Inc. has released updated RPMs for EasyApache 4 on January 25, 2017, with PHP version 5.6.30, 7.0.15, and 7.1.1. This release addresses vulnerabilities related to CVE-2016-10161, CVE-2016-10162, CVE-2017-5340, CVE-2016-7479, CVE-2016-10158, CVE-2016-10159, and CVE-2016-10160. We strongly encourage all PHP 5.6 users to upgrade to version 5.6.30, all PHP 7.0 users to upgrade to version 7.0.15, and all PHP 7.1 users to upgrade to version 7.1.1.
cPanel, Inc. has released updated RPMs for EasyApache 4 on January 25, 2017, with updated versions of PHP 5.6, 7.0, and 7.1. Unless you have enabled automatic RPM updates in your cron, update your system with either yum update or WHM’s Run System Update interface. Posted 1:19 pm by Shaun Reitan & filed under cPanel, Security. Fixed password used for Munin MySQL test account. The Munin monitoring tool includes a plugin to check the status of the MySQL service. This plugin used a dedicated test MySQL user to provide this functionality. The password set for this user was identical to the username. In cPanel’s current configuration of Munin, this MySQL user is no longer required and has been removed. Self-XSS in paper_lantern password change screen. Reflected XSS in reset password interfaces. Self-XSS in webmail Password and Security page. Arbitrary file read via Exim valiases. When processing the valiases for a user, Exim was running as the root user. By creating a valias that included other files, an attacker was able to read arbitrary files as the root user. This issue was discovered by RACK911Labs.com. Exim piped filters ran as wrong user when delivering to a system user. Piped commands executed by the central_user_filter were run as the nobody user. Now the filters are run as the system user’s UID. Leech Protect did not protect certain directories. The Leech Protect system allows admins to detect unusual amounts of activity on password protected directories. This system was not functioning on directories with a two character name. Exim transports could be run as the nobody user. It was possible to run exim transports as the nobody user if the receiving email domain was removed during delivery. Transports will now run as the proper user even if the domain no longer exists. Improper ACL checks in xml-api for Rearrange Account. Using the ‘fetch_transfer_session_log’ API, it was possible to fetch transfer information created by other resellers. This could reveal potentially sensitive information to an attacker. SSL certificate generation in WHM used an unreserved email address. In WHM, if you generate a certificate using the “Generate an SSL Certificate and Signing Request” interface and select “When complete, email me the certificate, key, and CSR”, it used “admin@” as the from address. The account name “admin” is not reserved in cPanel & WHM, so if this account was created, it would intercept any replies or bounces. Account ownership not enforced by has_mycnf_for_cpuser WHM API call. The has_mycnf_for_cpuser WHM API call did not verify the caller’s ownership of the specified account. This could allow for a limited amount of information about the user’s MySQL configuration to be leaked. Stored XSS Vulnerability in WHM Account Suspension List interface. When viewing the WHM Account Suspension List with the ‘nohtml’ flag enabled, the response to the browser was sent with the ‘Content-type’ header set to ‘test/html’. This caused text to be misinterpreted as html markup. Format string injection vulnerability in cgiemail. The ability to supply arbitrary format strings to cgiemail and cgiecho allowed code execution whenever a user was able to provide a cgiemail template file. Format strings in cgiemail templates are now restricted to simple %s, %U and %H sequences. WHM ‘enqueue_transfer_item’ API allowed resellers to queue non rearrange modules. The ‘enqueue_transfer_item’ API allowed resellers with the ‘rearrange-accts’ ACL to add items from arbitrary Whostmgr::Transfers::Session modules. This could have potentially allowed for a reseller with the ‘rearrange-accts’ ACL to initiate a remote transfer or perform other restricted operations. Open redirect vulnerability in cgiemail. The cgiemail and cgiecho binaries served as an open redirect due to their handling of the “success” and “failure” parameters. These redirects are now limited to the domain that handled the request. HTTP header injection vulnerability in cgiemail. Case SEC-215: The handling of redirects in cgiemail and cgiecho did not protect against the injection of additional HTTP headers. Newline characters are now stripped from the redirect location to protect against this. Reflected XSS vulnerability in cgiemail addendum handling. The “addendum” parameter was reflected without any escaping in success and error messages produced by cgiemail and cgiecho. This output is now html escaped. Posted 3:09 pm by Shaun Reitan & filed under cPanel, Security. cPanel has rated these updates as having CVSSv2 scores ranging from 2.1 to 6.8. Once sufficient time has passed, allowing cPanel & WHM systems to automatically update to the new versions, cPanel will release additional information about the nature of the security issues. This Targeted Security Release addresses 17 vulnerabilities in cPanel & WHM software versions 11.62, 11.60, 11.58, 11.56, and 11.54. Additional information is scheduled for release on January 17, 2017. New cPlicensing.net site is now live! Posted 5:39 pm by Shaun Reitan & filed under Announcements. We decided to standardize cPlicensing.net by building the new site around our existing NDCHost.com design. Not only that but we also decided to redesign the cPlicensing.net logo using the same idea. We’ve pleased to announce that the new cPlicensing.net and logo are now live! Feel free to check it out and report any issues and/or concerns you may have. Posted 2:36 pm by Shaun Reitan & filed under cPanel, Security. 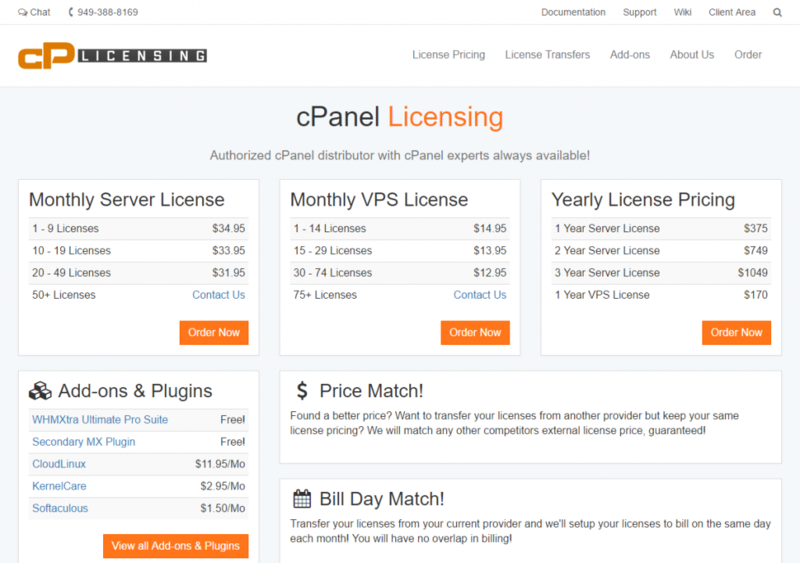 cPanel has rated these updates as having CVSSv2 scores ranging from 2.1 to 10.0. The cPanel security team identified the resolved security issues. There is no reason to believe that these vulnerabilities have been made known to the public. As such, cPanel will only release limited information about the vulnerabilities at this time. Once sufficient time has passed, allowing cPanel & WHM systems to automatically update to the new versions, cPanel will release additional information about the nature of the security issues. This Targeted Security Release addresses 20 vulnerabilities in cPanel & WHM software versions 11.54, 11.52, 11.50, and 11.48. Due to the severity of the issues addressed in this release, cPanel is extending the blackout period on additional information to a full week. Additional information is scheduled for release on January 25, 2016. EasyApache 3.26.6 released to address multiple CVE security issues! Posted 4:10 pm by Shaun Reitan & filed under cPanel, Security. cPanel, Inc. has released EasyApache 3.26.6 with PHP versions 5.4.32 and 5.5.16. This release addresses vulnerabilities CVE-2014-3538, CVE-2014-3587, CVE-2014-2497, CVE-2014-5120, CVE-2014-3597, CVE-2014-4670 and CVE-2014-4698. We encourage all PHP 5.4 users to upgrade to PHP version 5.4.32 and all PHP 5.5 users to upgrade to PHP version 5.5.16. All versions of PHP 5.4 before 5.4.32. All versions of PHP 5.5 before 5.5.16. Fixed bug in the Fileinfo module related to CVE-2014-3538. Fixed bug in the Fileinfo module related to CVE-2014-3587. Fixed bug in the GD module related to CVE-2014-2497. Fixed bug in the GD module related to CVE-2014-5120. Fixed bug in the SPL module related to CVE-2014-3597. Fixed bug in the SPL module related to CVE-2014-4670. Fixed bug in the SPL module related to CVE-2014-4698. cPanel, Inc. has released EasyApache 3.26.6 with updated version of PHP 5.4.32 and PHP 5.5.16 to correct these issues. Unless you have disabled EasyApache updates, EasyApache updates automatically. Run EasyApache to rebuild your profile with the latest version of Apache. Posted 12:45 am by Shaun Reitan & filed under Security. cPanel, Inc. has released EasyApache 3.26.5 with PHP version 5.3.29 and a patch to libxml2. This release addresses libxml2 vulnerability CVE-2014-0191 and PHP vulnerabilities CVE-2014-3981, CVE-2014-3515, CVE-2013-6712, CVE-2014-0207, CVE-2014-0238, CVE-2014-0237, and CVE-2014-4049 by fixing bugs in PHP’s core and PHP’s Network, Fileinfo and DateInterval modules. We encourage all PHP 5.3 users to upgrade to PHP version 5.3.29. All versions of PHP 5.3 before 5.3.29. All versions of libxml2 before EasyApache version 3.26.5. Fixed bug in the libxml2 library related to CVE-2014-0191. Fixed bug in the configure script related to CVE-2014-3981. Fixed bug in the SPL component related to CVE-2014-3515. Fixed bug in the DateInterval module related to CVE-2013-6712. Fixed bug in the Fileinfo module related to CVE-2014-0238. Fixed bug in the Fileinfo module related to CVE-2014-0237. Fixed bug in the SPL module related to CVE-2014-4049. cPanel, Inc. has released EasyApache 3.26.5 with an updated version of PHP 5.3.29 and a patch to libxml2 to correct these issues. Unless you have disabled EasyApache updates, EasyApache updates automatically. Run EasyApache to rebuild your profile with the latest version of Apache.